PASADENA, CA; JANUARY 20, 2014 – Today at the Television Critics Association Winter Press Tour, PBS announced a new slate of programs to air in the spring of 2014 and beyond. A brief synopsis of each program is listed below, along with links to the full press releases. A new addition to the Ken Burns pipeline, COUNTRY MUSIC will air in 2018. COUNTRY MUSIC will follow the evolution of country music over the course of the 20th century, as it eventually emerged to become America’s music. Click for more information. BBC Worldwide North America Sales & Distribution and PBS announced that the critically acclaimed British drama LAST TANGO IN HALIFAX will return for a second season in the U.S. on June 29 2014 at 8:00 p.m. ET, solidifying PBS as a destination for Sunday night drama. Click for more information. EARTH — A NEW WILD takes a fresh look at humankind’s relationship to the planet’s wildest places and most fascinating species. The ambitious new five-part series shows nature as we almost never see it on television and is scheduled to air in 2015 on PBS. Click for more information. PBS announced a lineup of programming timed to Memorial Day 2014, as well as this year’s 70th anniversary of D-Day. The centerpiece of PBS’ salute to veterans is the 25th installment of the live broadcast of the NATIONAL MEMORIAL DAY CONCERT, co-hosted for the ninth consecutive year by Joe Mantegna and Gary Sinise. PBS also pays tribute to veterans and their families with COMING BACK WITH WES MOORE, Moore’s search for answers to some of the most difficult questions facing returning vets. NOVA will present “D-Day’s Sunken Secrets,” which follows the collaboration among military historians, archaeologists and specialist divers to survey the underwater wreck sites bordering the D-Day beachheads. Click for more information. The “Think Wednesday” primetime line-up includes new episodes of acclaimed series NATURE and NOVA in the 8 p.m. and 9 p.m. hours respectively, and new specials debuting at 10 p.m. 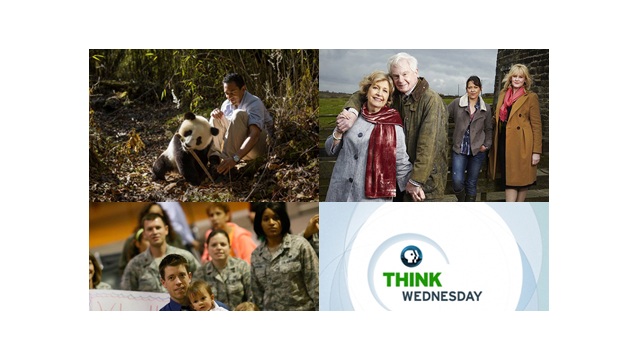 The “Think Wednesday” lineup premieres Wednesday, April 9, with new episodes of NOVA and NATURE and the premiere of YOUR INNER FISH at 10 p.m. Click for more information.